The 1st Sutton Coldfield Scout Group was formed in 1908 and is the oldest Scout Group in Sutton Coldfield West District. The 1st Sutton Coldfield Scout Group provides adventurous activities and personal development opportunities for boys and girls aged 6-25 in Sutton Coldfield West District which is in the County of Birmingham. The aim of the group is to provide young people with the opportunity to take part in ‘Everyday Adventure’. Each section runs activities throughout the year. Examples of which are camping, rock wall climbing, archery, air rifle shooting, 5 & 7 a-side football, bush-craft, back woods cooking, abseiling, hiking, crafts & pioneering amongst many other activities. 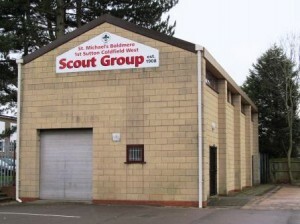 1st Sutton Coldfield Scout Group is lucky to own a large secure hall which is situated just a short walk away from the busy Boldmere High Street shopping centre and Sutton Park’s Boldmere Gate entrance. Our Scout Den can be easily found at the rear off St. Michael’s Church Hall, 192 Boldmere Road, adjacent to Boldmere Clinic and just round the corner from Boldmere Primary School. We have excellent facilities and equipment and all sections are very active and we have a large well-trained leadership team. 192 Boldmere Rd, Sutton Coldfield, B73 5UE.